Whilst I’m a complete scaredy cat when it comes to going to the hairdressers (honestly I thought it’s only men that have an issue with how long an inch is!) I am a huge fan of those little L’Oreal power shot treatments that you get in salons, so when I heard of L’Oreal EverRiche Perfect Elixir I had high hopes for it. Since quitting colouring and embracing my natural hair colour I’ve found my hair to be a lot more manageable though my reluctance to have it chopped has left me with dry, split ends. In essence Perfect Elixir is a spray in, rinse out conditioning mask masque that promises to leave your hair soft and nourished. For those of you with fine hair it’s recommended that you use the masque in lieu of conditioner, but I personally condition as usual and then apply the spray through my hair from mid to ends and then use my fingers to comb it through. As I’m an impatient washer/showerer I try to plan my shower routine around the masque to ensure I have something left to do to keep me occupied whilst the masque sinks in as I find there’s nothing worse than standing around in the shower waiting to wash something off. This usually means I leave the masque on for 2-3 minutes before rinsing thoroughly. The first time I used Perfect Elixir my hair seemed less knotty and had a noticeable softness and shine akin to having a gloss treatment. To be honest I was sold there and then and knew this would be a repurchase product, but in the interests of a fair review I’ve waited a couple of months before reviewing it fully. In this time I’ve noticed that my hair goes back to it’s usual knotty, dry self on the days I don’t use the spray, which would suggest that the masque isn’t improving the condition of my hair long-term. That said, as soon as I use the masque again my hair goes back to looking fab and as it’s not much hassle I’m happy to use it every time I wash my hair. In terms of packaging the spray bottle is a tad awkward to use, but bearable. In recent use I’ve found the nozzle to get blocked but a quick rinse under the shower after use tends to get rid of the excess product and leaves it working the next time I come to use it. All in all I don’t think you can go far wrong for £6.99. 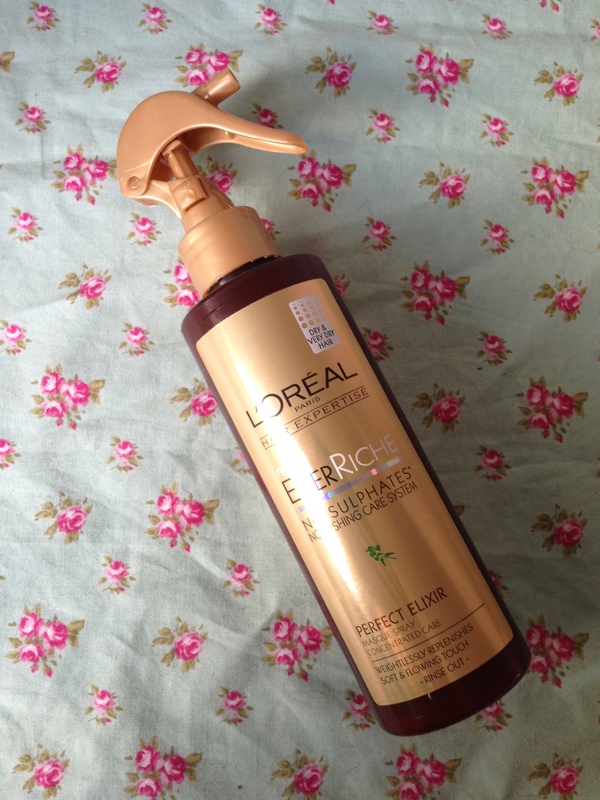 You can pick up L’Oreal EverRiche Perfect Elixir Spray Masque from Boots.